Catch band activity at a glance on your Icom IC-703 with the built in spectrum scope. 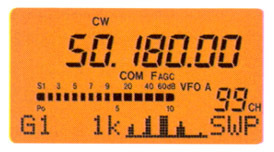 With the operating frequency in the center of the display, each step either to the left or right of center is selectable from 0.5/1/25/10/20/100 kHz steps. Copyright 2003-2011 Universal Radio, Inc.